It’s not only me having the Giveaway. Katriona and Maria also are and so will Angela a little later this week. What would you get? 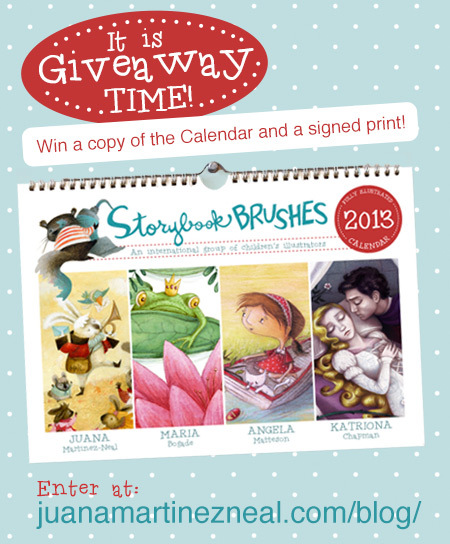 We are giving away 1 copy of the Storybook Brushes 2013 Calendar and a print from one of us. If you enter here and you win, you will get one of my prints. If you enter Kat’s giveaway by posting a comment on her blog and win, you will receive the calendar and a special gift from here. The same goes for Maria and Angela. No limit of entries, no matter where in the world you live. Now you probably want the details! 1. Liking the Storybook Brushes FB page. And don’t forget to come back here and post a comment telling me what you did. Each one counts as an entry. Winner will be announced here on Thursday, January 24th, 2013. Get me a Calendar Now! I liked you on FB and follow you on twitter, this is a great Giveaway. Okay – I liked, followed and tweeted. Yay! Tweeted & followed. LOVE the illustrations on the cover. Can’t wait to see the inside! Followed, liked and tweeted (FB and Twitter) :) lovely calendar! I’ve double tweeted & face book liked & shared. I really like your calendar, you have nice illustrations. Okay – done, done, done! HI Juana! I’ve tweeted and liked.. and followed! I’d love to win your giveaway! I liked it in FB. Love your creativity. Tweeted & facebook shared again. When are the winners announced?